A copy of the German mountain troops (Gebirgsjäger) rucksack. At first we were a bit reluctant to take these, but to our surprise these are actually pretty good (yes, yes, we know we warned you about chinese copies). 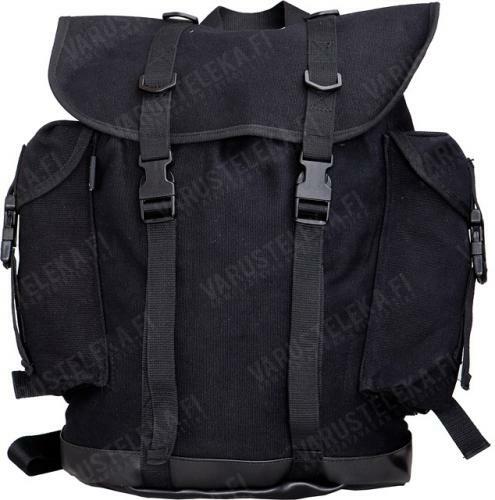 Basically this is a normal-sized backpack, with two outer compartments and a load of loops for securing additional gear to it. The genious of it all lies (again) in German engineering - although this pack does not have a frame, the Bundeswehr issue folding sleeping mat slips into a separate pouch and keeps the pack rigid and makes it really comfortable to carry. This also eliminates the need to carry a traditional roll-mat outside the pack, essentially allowing more stuff to be strapped on if needed. All buckles are freely adjustable. The side pouches are sewn on only from the sides, so carrying skis, an axe or a pick is not a problem either. 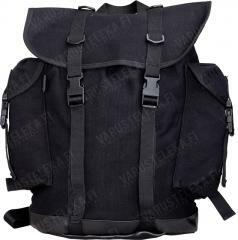 The shoulder straps are padded and can be quickly tightened by pulling the loose ends. 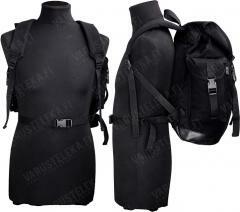 Removable waist strap included. Although not real army issue article, these are OK and should hold up well in normal use (anything else than combat use). And these are black, too, if that's the thing for you. Tyylikäs ja tilava kuin mikä, kelvollinen kaupunkikäyttöön ja jopa salikassiksi. Metsäretkille jääkärikopio ei kuitenkaan sovellu: selkämys on paksuhkoa puuvillaa, eli se ei hengitä hiukkastakaan ja hikoilustasi kastuessaan se kans sitten pitää huolen että selkäsikin pysyy märkänä loppupäivän. I bought this product last year and I've used it accordingly. From laptop carrying to groceries and it's held up fantastically. The only caveat is that the protecting plastic that covers the bottom of the rucksack is peeling off, leaving an undyed patch of fabric exposed. Siis tämä kokemus yhdestä tähden arvostelusta perustuu myös siihen hypeen mikä tämän repun video on väittänyt kyseisestä repusta. Ei ole niin kestävä. Se kyllä näyttää hyvältä mutta en kyllä suosittelisi. Reppuun mahtu iso kaljalaatitkko. Naapurin mummot eivät paheksu kun eivät näe sita.